In 2005, we inherited a vintage 2-harness Union 36 rug loom. After a few repairs and lots of help from more experienced weavers, the loom is up and running. 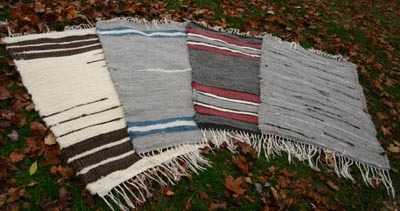 As a result, we are now offering some of our handwoven rugs for sale. We also offer custom rug weaving if you desire a certain pattern or color. Email us (pitchfork@usol.com) for more information. Here are a few examples of our rugs made from roving. These particular rugs are about 3′x5′. We can make them longer, shorter, and narrower, but not much wider on our current loom. 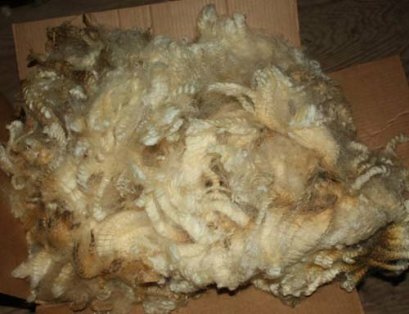 All of the fiber used in the weft is from our sheep and llamas. The red and blue stripes are from hand-dyed roving. The color and stripe configuration possibilities are limited only by the imagination. Rugs like these would be priced at $125-$200 each.